We just had one of those perfect weekends where we really did so much but it felt like we had nothing to do at all. I know that doesn't make much sense, but if you've had a weekend like that, you understand! Last week was CRAZY busy for the both of us. I had court all week (and all this week) and Forrest was on rotation in Talledega and in Tuscaloosa. We have also had several busy weekends in the past and when this weekend ended up being fairly "lite" in comparison, it was really wonderful! On Friday night we had plans to meet the Bailey's for dinner at the Courtyard and stay and listen to Jay's band play to celebrate Forrest's grandmother Frith's coming to Gadsden for a visit. I was SO tired that day and didn't feel good at all so I had gone home a little early to relax and take my time getting ready. Unfortunately, Forrest's grandmother was tired from her travels and didn't feel like going out. Since I wasn't feeling that great either, Forrest picked up a pizza on the way home from school and we just laid around and ate and watched tv. How nice! I had late night plans to see Something Borrowed with Farrah, Gina, and my sister, and luckily I felt well enough to meet them at the movie. It was super cute and I'm so glad I went!! I usually can get myself up for a good girly movie with bad reviews (usually, the worse the review, the better I like it!). On Saturday I slept late and even Forrest laid around all morning. At about 11 we packed up and headed to the lake to enjoy the lovely weather! I LOVE going to the lake. Whenever I feel like I need to relax or take some time off, I always want to go to the lake, and this weekend was no exception. It takes very little time to get there and especially when we only go up for the day, it takes next to no time to pack and get ready. We got up there about lunch time and spent the whole day outside. The dogs really love going up there and Sonny especially loves swimming and chasing after his tennis ball. Ruffles usually just lays with me on the lounge chair while I read. This time, Forrest brought his road bike and got in a good 30 mile ride while I lounged on the pier talking to friends on the phone! We stayed until after 5, and would have stayed later except the wind picked up and made it a little bit chilly. Once we got home, Forrest did some odds and ends in the yard and I baked some brownies for Mother's day and cleaned up a bit around the house. We ate left overs for dinner on the couch and even rented a movie (Love and Other Drugs--pretty good although depressing). I know that doesn't sound like much of a night but to us it was fantastic!! Sunday we went to Mass and then out to Duck Springs to celebrate Mother's Day with the Bailey's. Davis made some yummy grilled chicken and we used my brownies to make parfaits! It was also nice to spend time with Forrest's grandmother who lives in Selma. For Mother's day, Forrest and Davis got their mom a kindle! She really liked mine when I brought it out to show her and so the boys new it would be a big hit, and it definitely was! After we opened presents, Mrs. Bailey had a surprise for us: since we weren't together on Easter, she had an Easter egg hunt planned for us! The stakes were raised when she said that the eggs were filled with cash! Woohoo! The rules were that you could only find 4 eggs and then you had to stop. I still maintain that Forrest cheated by holding me back by the arm so I couldn't find eggs! However, I was a lackluster egg finder. I only found 2 on my own and Forrest had to help me find the 3rd (after he found 4). I couldn't even find my 4th one and by that time no one could remember where it was! Despite my bad hunting skills, I made $20 in the egg hunt! Hooray! Forrest made $35! Mrs. Bailey was so sweet to do that for us! Next, we got started on our regular Sunday chores. Yard work and homework for Forrest, grocery shopping for me. Then it was time for Mother's Day at my parent's house. Dad, as usual, cooked a great dinner and we all sat outside enjoying the evening while we waited on it to cook. After dinner it was time for presents, and what did we get my mom? A kindle!! Again, after she saw mine she decided she couldn't live without it, so we ended up investing in 2 more! Anything for our moms!! Before we left, I helped my sister pack for her study abroad in Italy (she leaves tomorrow and I am SO jealous!!) and Dad asked Forrest to help him set up his Pandora on the tv. What started out as an easy set up turned into an hour and a half singing and dancing extravaganza! We ended up starting 5 stations for dad and each had an opinion as to whether we liked the songs our not. We were having so much fun we didn't realize that we had stayed until after 10pm!! That is really late for us on a Sunday night! As I close this post I want to give a big thank you to all the mom's out there. You are truly remarkable and I totally look up to you! Finally, I want to leave everyone with a thought from church yesterday: God is in the small things. Yep, that's right, He's in the dishes, the laundry, the weed eating, the taking out the trash, etc. You may have to look for Him, but he is always there! That idea really spoke to me yesterday and I hope it might give you a little smile for the week! 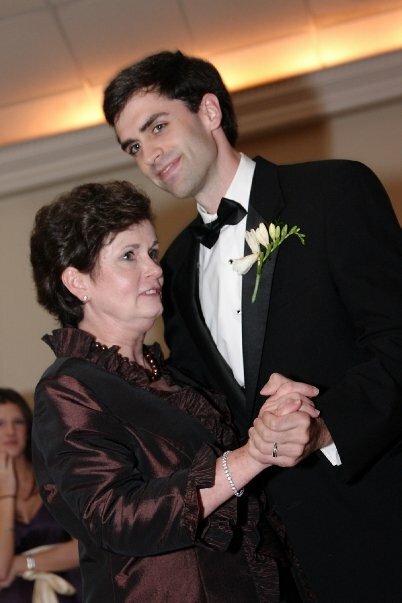 Me and my mom before I walked down the aisle.